Great to have Jerry Cantrell come out and rip through 'Man In The Box'. Sammy sings it great!! Great to have my buddies Craig and Q-Ball at the show. Craig hadn't been since Mayo of '93 with me for Los Tres Gusanos. 22 years later and finally swilled back a lime margarita with him. Craig loves the Courtyard burrito's at the Cantina. How is the line up looking for Dinner tickets? ANAA I am 6'2 you can have a piggy back ride if I can get a ticket for the show. I don't have one yet. I'll be there 9th -13th. Looking for 2 tickets for the 9th,,,can anyone help? In Cabo at the Riu Palace,,,,would like to find 2 tickets for Oct 9th show,,can anyone help me? Just thought I'd reach out again. Looking for one ticket for Friday night for myself. Will gladly pay more than normal price, and will buy beers inside!!! Thanks! Booked hotel and flights when we entered the drawing, both my wife and me. Got skunked, cannot believe it. Can't get refund. Need 2 tickets to either show, will pay $ over the cost. Please email me at skpdad5@aol.com. Thank you very much. I just confirmed my trip to CABO and I need 2 tix to either the 2nd or 3rd show...I am willing to pay almost anything, please let me know if anyone can help me out? Hey guys, desperately looking for a ticket for night 2. I'll be in Cabo solo and really want to see this show, got shutout again. If anyone has an extra they want to sell, please let me know. I can meet you anytime outside for the wristband or whatever. I'll buy beers all night too!! There are no chairs/tables in the concert area during these shows. There are some in the outside area where you can hear the show. so exicted to see Sammy I don't want to be ran over. hehehe. Booked flight, hotel for this year. Surely thought we'd get one night since we hoped, prayed, crossed fingers and entered faithfully for all 4 nights. Got none. If anyone has any extra tickets, or has a change of plans, feel free to contact me at ivy@wiredisland.com. I would be happy to buy your tix off of you. My sister and I are going for this chance of a lifetime event in Cabo. I have never been out of the US so this will be amazing. Just saying "hi" to those going on October 9th, the second night. YES! We are in for night 2. So red-excited! Had to settle for Vegas last year, now to book flight and room! 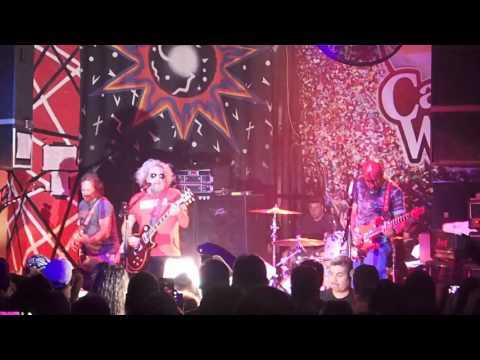 Let's party Cabo-style red-rockers!See ya all in Cabo! If anyone has a single they would like to get rid of for the second night I will take it! For cash of course, and Ill buy plenty of beers inside! I'll be in Cabo all week and would love to get in for the first and second nights, but I was shut out. Just looking for a single. My Honey won tickets! we are so excited! that everyone that got 2 and 3 tickets was as kind as you..
next year!!! I hope you have Blast in CABO!!!!! Thanks Diamond!! That was a very nice thing to do. Have a great time at the show!! Thank you Diamond that was very nice thing to do. Does anyone know when the second chance drawing will be done. From one RedHead to another thank you for returning the one night. There seems to be a good amount who are and once again thanks to those that are. I received confirmation for night one and night two. I have returned tickets for night one. Good luck with the second chance drawing! Got tickets for shows 2 & 3 . My buddy got tickets for show 4! Cyall in Cabo!!! The dinner/show tickets are actually sold as follows the 7th/9th on the 6th and 11th/13th on the 10th. No, you can wait in line the day of the show for dinner/show tickets. I'd recommend checking out the line the day before the show. There's probably only 50 of these tickets. If anyone wins tickets through draw, please post when you received the confirmation email... Thank you. I have been there 8 years in a row and have won tickets once please Friday Sunday Tuesday any day.Please be my year.Steps away at Mar De Cortez. 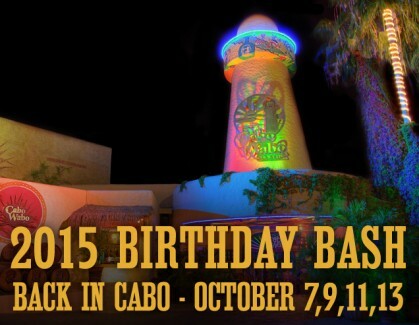 I'll be in Cabo from 10/4 to 10/18 and registered for birthday bash tickets. I recently received new credit card with same account but different security code. What is correct protocol? Should I re-submit for ticket lottery? Sammy rocks the house Ive seen him a few times in my life !!! I will be going to Cabo to see him sometime in my life !!! Well Sammy I Was at a show in the late 80s or early 90s at alpine valley and you did an acoustic all by your self was a great tune did u ever put it on record ? You were in Chicago the night before you said u just made the tune the night before , you made a joke of the song about a woman I believe which everyone laughed lol but it was a great acoustic tune loved it if you can help me out here that would be awesome thks !!! Music is my life !!! I have friends that go to Cabo see you this yr I hope !!! There is going to be an announcement by the end of month. Do we have an ETA when the lottery will begin... ??? We had tickets last year and hoping for this year!!! You do not have to be a redhead member to enter the drawing. The better question is why would you not sign up to be one? The Birthday Bash Shows are handled differently in terms of ticketing due to the specialty factor of them. Do you have to be a Redhead to enter the lottery? For other events (following the "get tix" link) it takes me to ticket.com where I can purchase up to 4 tickets. They just do the lottery for Cabo? If they do ticketing like in previous years you can buy dinner/show combo tickets at the Cabo Wabo. They have been on sale two show dates at a time and following this routine. The 7th and 9th go on sale the 6th, and the 11th and 13th go on sale the 10th. I know in past years people line up for these VERY EARLY like as in the day before. These are also limit of two per show per person and priced at $90. Is the lottery the ONLY way to get tickets? Friends of mine are coming with me also, and they would like to go to the show too. I haven't been to Cabo since 1998, and the process is different now. The lottery in past years has been an on-line entering process. There are links posted for each show and you click into which show(s) you wish to be entered into. I will give you a word of caution DO NOT put your name into ones you can not be at. These are not tickets in the traditional sense. They are wristbands that you get at the day of the show at the Cabo Wabo. There is a limit of two per show and the wristbands will be put on you and your guest at the same time. You and the guest have to be TOGETHER. I'm also new to this, is there a max number of tickets one can get?? Is the lottery on-site or online?